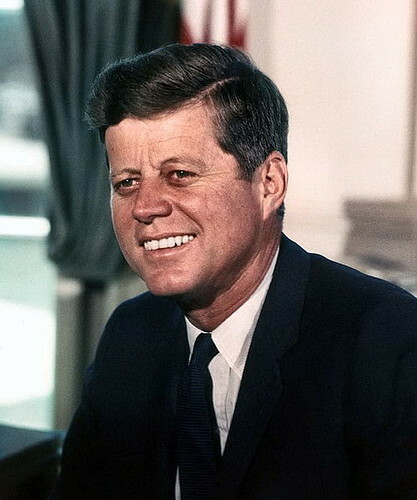 I was a third grader at Saint Philip Neri Elementary Schoolin Chicago, Illinois, when the principal’s voice came over the public address system, announcing that President John F. Kennedy had been shot in Dallas. She asked all the classes to stop what they were doing and join in prayer for our president. It was just after 10:30 in the morning, exactly 50 years ago today. For a split second, everyone in our class froze in confusion and disbelief. Our teacher, Mrs. Tormey, was the first to cry, and the rest of us followed. The door was open, and we could hear similar outbursts from the neighboring classrooms. It took a few seconds before we realized that the principal was still on the P.A., praying the Rosary. We joined in and prayed for John F. Kennedy with all our hearts. My memory of the next half hour or so is more blurry than the beginning. The teachers must have been as confused as anyone as to what to do next. I think there was another announcement, because the teachers brought all the students into the corridor. There they instructed us to sit on the floor against the walls, as we continued to pray. This was not unusual to us, as we were accustomed to sitting in the long corridors during tornado warnings and air raid drills. The P.A. system stayed on as Sister led us through our prayers, the faint sound of a news broadcast playing in the background. When she broke the news to us that President Kennedy had died, the hall erupted into a chorus of sobs, and we were dismissed for the day. My little sister and I walked the three blocks home to find our mother glued to the TV set in the living room, crying her eyes out. She took our hands and led us to the couch, where we all sat down to watch as CBS news anchor Walter Cronkite bravely announced the breaking developments. I and others my age learned a new and sad vocabulary over the next several days. Bulletin. Assassination. Motorcade. Grassy Knoll. Secret Service. Texas Book Depository. Suspect. Tragedy. Tarmac. Air Force One. Swearing-in. Lying-in-state. Rotunda. State funeral. Caisson. Taps. Eternal Flame. We learned new names, too: John Connolly. Lee Harvey Oswald. Jack Ruby. 1963 had been a year of sad losses for me. It began when my adored Nana – my maternal grandmother Alice (McGinnis) Schiavon, died in the early hours of New Year’s Day. Six months later, on June 3, Pope John XXIII died. In my childlike way, I had loved him because he looked kind and grandfatherly and was as close to God as anyone could get. And then we lost our young and vibrant president on that sunny day in November. My innocent eight-year-old mind could not comprehend any of it. My sweet mother turned from the sink and took me in her arms. There was nothing she could say at that moment. We just hugged each other, knowing the world would never again be the same. I think most people felt the same way. In fact, on that day, the immediacy of television for the first time ever brought history right into our living rooms and connected us through tragedy. No matter who you were or where you were in the world when JFK was assassinated, you were right there – with him, with Jackie and Caroline and John-John, with Lyndon Johnson and all the rest. From the depths of darkness came flickers of light as people young and old sought to do good and carry out his vision to better the world. It took time, but we healed, albeit with scars, thanks to the legacy of hope and aspiration and service that JFK had instilled in us during his three short years as president. As I remember where I was on November 22, 1963, I also remember where I was on July 20, 1969. I had just turned 14. Six years had passed since JFK’s death, and our family and millions of others across the globe once again gathered around our television sets. This time, the occasion was marked by joy and anticipation. My parents halted their wallpapering project and called my sisters and me to watch as astronaut Neil Armstrong landed Apollo 11 on the moon, fulfilling John F. Kennedy’s pledge that the United States would make a moon landing by the end of the decade. As Armstrong stepped down from the lunar module onto the moon’s rocky surface, we cheered triumphantly, for his achievement, for our nation, and for our late president. Your memories are more vivid than mine and so well articulated. Thank you for sharing your memories! Thank you so much, Kathy! I've enjoyed reading your own memories and those of your family. It amazes me how millions of people shared the same sadness that day yet experienced it in our own unique ways.